I'm me and you're you. 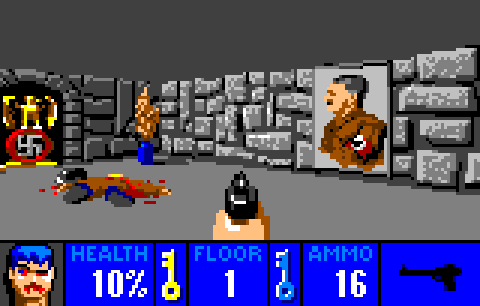 NOTE: Not playable here due to cartridge swapping. Only the menu is here due to level data on other carts. 10 carts in use with this alpha release. "Dead people are going to die." Are you an awesome enough starship captain to direct your landing parties through the perils of nine mysterious worlds? Welcome to Landing Party of Legend, a strategy adventure game of campy, red-shirt-style attrition. You and several other famous and notorious people from history have escaped your captors and are trying to make it back to Earth (without too many casualties) so that the world may know your tale. Thanks goes to @geckojsc's RPG Dialogue Scripting Demo for giving me some skeleton code to start building from. Only content for the first planet is written, with 100% recycled content for the other 8 planets at the moment (mashed up in various ways). The goal is 25% new content for each planet with various mashups of base content and ramping difficulty (which includes making the first planet easier). A couple more interaction types and humor points are coming as well. I ran out of code space to add them to the story processor but have plans to do another cartridge split to make room for them. As a spinoff to TTF fonts by @RythmLynx, I created some bitmap fonts (in various typefaces) because I could map them to both OEM and Windows 1252 (which also includes ISO 8859-1) for use in text editors. I have FON font files for only Windows right now (until someone converts them to the Linux types and tests them). UPDATE: DejaVu TrueType fonts have been added to the collection. 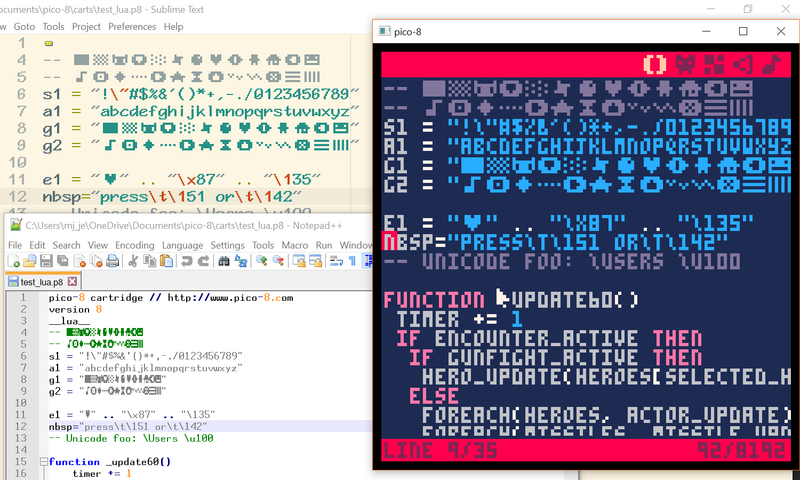 Screenshot of the same p8 file open in Sublime Text, Notepad++, and PICO-8. In the spirit of sharing readable code, it should not cost tokens for things that only serve to make the code more readable. There are exceptions, of course, that can't be helped, where you might choose a short and less-readable algorithm over a more verbose one that does the same thing -- such as what I call the poor-man's ternary (c = a > b and 3 or 2) versus the "if" block (if a > b then c = 3 else c = 2 end). Anyhow, back to the point, constants are one thing that serve no purpose other than to make reading and debugging easier. Thus, I feel, declaring a constant should cost no tokens in order to encourage the use of them. Referencing a constant, of course, should still cost a token. Now, as most of you have already shouted out, the primary flaw with this proposal is that Lua does not support constants. Constant declarations would have to be added to the PICO-8 flavor of Lua which, well, is already not pure Lua. Furthermore, Lua was surely not imagined to be limited by tokens... so it seems fair to tweak PICO-8 Lua in this way in response to PICO-8's limitations. ... but it would just be much simpler if I didn't have to pull such shenanigans to get my tokens back (which will also have the side effect of making the code I may distribute less readable).